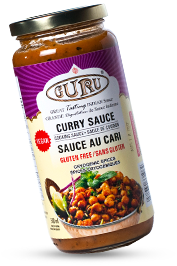 Why Guru Foods Indian Sauces? 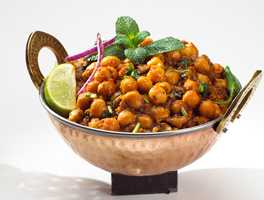 Chef Harry (Guru) Khanna has spent the last 20 years creating spectacular Indian dishes for his family and this restaurant. He is now sharing his recipes with the world by launching Guru Foods Indian Sauces – an authentic line of Indian sauces made with cryogenic ground spices and natural wholesome ingredients. 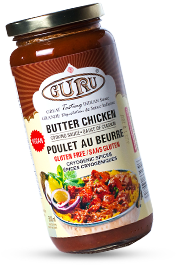 Guru Foods Indian Sauces are low in fat and have far less in sodium than other leading brands. 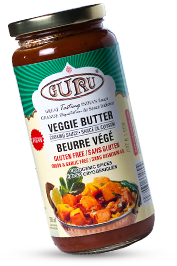 Guru Foods Indian Sauces are rich in taste and contain only 2 grams of fat and 130 mg of sodium per serving! Cryogenic ground spices retain quality and wholesomeness. 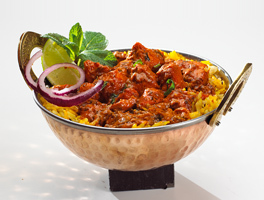 In traditional Indian cooking heavy cream is added to enhance the flavour and texture of the final dish. 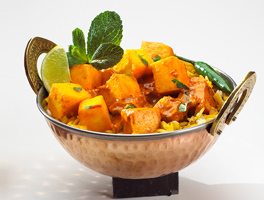 You can enjoy Guru Butter Chicken and Guru Veggie Makhni with, or without, cream. You control the calories in each dish.